I dedicate this final day of Sailor Moon week to pretty, pretty pictures. 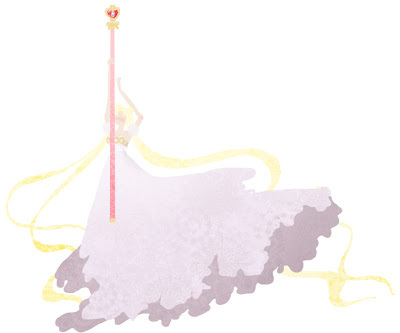 Having a gaggle of princesses with superpowers leaves a lot of room for many fanciful drawings, and, after twenty years, there is no shortage of really pretty Sailor Moon art. Yesterday's post featured some good stuff, but today I wanted to share... a lot more, and contribute something of my own. So, erm, basically I doodled Princess Serenity. I think it turned out pretty well. It's no masterpiece, but I broke out my old tablet and everything. If you have some time on your hands, I've got a seven-page collection of great fanart on deviantART. 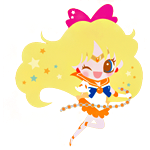 I've also been browsing pixiv, which is mostly in Japanese... but that just means there's even more great Sailor Moon artwork. 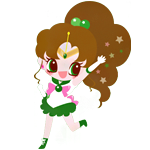 You can view my bookmarks here, though they're only mostly Sailor Moon. There's also a lot of good tumblrs that'll toss fanart at you on a daily basis; I get most of my eye candy from Simply Sailor Moon. In closing, I would also like to share that, during my freshman year of high school, my P.E. uniform, instead of my name, said Usagi Tsukino. In hiragana. And I drew a bunny. My teacher told me several times that I had to change it, but I refused, for I have always been what they call a "rebel."